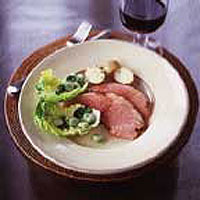 Put the gammon in a large saucepan with the vegetables, bay leaf, parsley and peppercorns. Cover with cold water. Bring slowly to the boil, skim off any scum, and simmer gently for 40 minutes. Remove from the heat and leave the gammon to cool in the water for about 2 hours. Preheat the oven to 200°C, gas mark 6. Mix together the honey, mustard, ginger, cayenne and paprika in a small bowl. Carefully cut the meat rind off the fat, without cutting the elastic string that helps keep the gammon in shape. Score the fat into large diamonds with a sharp knife, and stud the diamonds with the cloves. Lay 3 large sheets of greaseproof paper in a roasting tin, one on top of the other. Put the gammon on the top sheet and liberally cover the meat with the honey mixture. Wrap the sticky meat in the first layer of paper before wrapping in the other two layers so the meat is protected by 3 layers of paper. Bake for 30 minutes then open up the parcel so that the gammon is exposed. Bake, uncovered, for 30 minutes. Serve hot, warm or cold with a lettuce, broad bean and mint salad (see right) and hot, buttered new potatoes.